When it comes to Traditional Indian desserts, nothing can beat Phirni.. A thick creamy milk pudding flavored with cardamoms and saffron. Soaked and ground Basmati rice is added to the milk and cooked on low flame stirring continuously until it thickens. I have used the Spanish Nitu Didi Saffron ( Nitu Chugani ) that I had won recently on Masala Minds. As we all know that Spanish saffron is the best in the world. A pinch of it gives the wonderful flavour and colour to the dish..while the phirni was cooking my house was filled with the sweet aroma of this amazing spice. 1. Wash and soak the Basmati rice in half cup milk for few hours. Grind to a paste using milk. 2. Bring the milk to a boil and add the ground rice. Continue stirring to avoid the lumps. Add the cardamom powder and a pinch of saffron. Keep stirring until it is thicker. 3. Now stir in the sugar and continue to stir. At no time you should stop stirring and it is better to use a wooden or silicon spatula. 4. When the phirni gets the thick porridge consistency switch off the gas. But you still have to stir it until it is luke-warm to avoid a thick layer forming on top. 5. Phirni is usually served in clay containers. Wash the containers and soak them in water for a few hours before using. Fill the clay cups with phirni and garnish with saffron (soaked in a tbsp of milk ) and powdered pistachios and cardamom powder. Refrigerate and serve chilled. Wow! I have one question....Does the clay smell incorporates with the taste of phirni? I have not tried clay pots because I feel that smell of clay destroys the yummy taste. 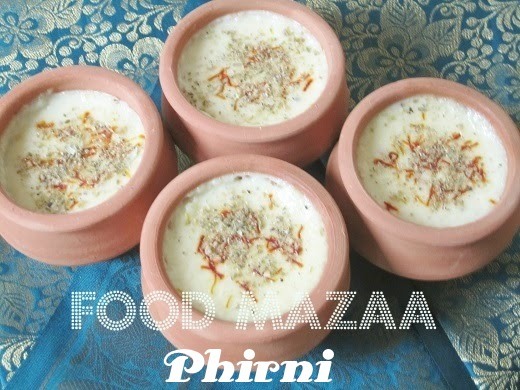 Very traditional and delicious phirni. yummilicious, lip smacking with an awesome presentation. WOW .....Famous dessert from North India. Picture perfect pair I, loved the color and can sense the texture, awesome click. liked your props dear :) delicious phirni..
what a treat to our eyes. do visit me too. Yummy and delicious. Cute pots. 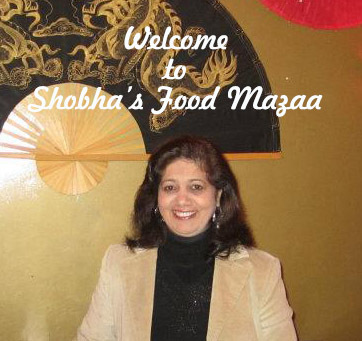 Perfectly done shobha ji! The earthen pots make them so authentic and homey! Such a creamy and highly inviting dessert..Love that serving pot. Luv Phirnis. Long time since I made some. Your presentation is soooo tempting. Wow Shoba the phirni looks very inviting.Never taste this love to try. Congrats on your win and superb Phirni.